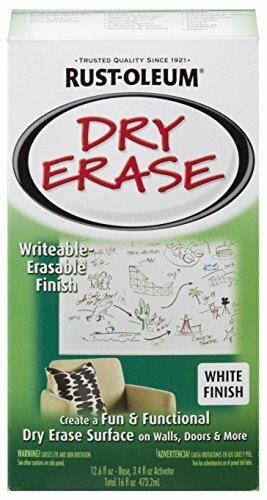 Dry Erase Paint transforms interior surfaces including drywall, masonry, wood, cement, metal and more into a writeable-erasable surface. Go ahead and draw on the walls, it erases! A clever way to keep track of daily chores, draw plans in a meeting or keep the kids occupied. Remove markings with an eraser, lint free cloth or dry erase cleaner. Easy to apply and ready for markers in 3 days. Note after blending paint for application, it must be used within 1 hour. Apply blue painters tape around the area you wish to paint and apply 2 to 3 coats. Wait 10-15 minutes between coats and apply a primer prior to use over dark color, bare wood and new drywall.